The desire for getting married in the Caribbean, on a jewel of an island surrounded by the beautiful waters of the Caribbean sea, is increasing. It is not surprising that the the Dominican Republic is one of the favourites destination when it comes to arranging a wedding the Caribbean because it offers the perect surroundings. Not only do many ordinary couples choose to get married on this wonderful Caribbean island, but many celebrities have also celebrated their wedding in the Dominican Republic. Most celebrities choose one of the many privileged and enchanted places to exchnage wedding vows. Amongst the many options in La Republica Dominicana is the delightful 'fantasy town' that is Altos de Chavon -- the setting, perhaps unsurprisingly, chosen by the late Michael Jackson for one of his marriages! But you don't need to be a celebrity to have a truly magical Caribbean wedding, there are many places far more affordable than commanding the central arena of Altos de Chavon. Maybe one of the most memorable ways to celebrate the moment of getting married in the Caribbean is on the soft, pure sands of a perfect Dominican beach! The Dominican Republic offers many beautiful white sandy beaches on which to celebrate your Caribbean wedding. There are also many good, reputable companies that will assist you in arranging a marriage ceremony in the Dominican Republic, and all the things you will need to experience one of those truly unforgettable Caribbean weddings. Whether you choose to be married on a Caribbean beach close to the gentle lapping of the warm, blue waters, or an exotic fantasy location like Altos de Chavon, or indeed any other place in the Dominican Republic, there are certain things you do need to know before your special day. - In a civil marriage if the happy couple are non-Dominicans they must present both their passports and Fé de Estado o Carta de Soltería, meaning a letter confirming you are single. If anyone has been married previously, they must submit their Certificate of Divorce. Both the 'Charter of Singleness' and the Divorce Act must be seen and recorded by a public notary (a specialized legal role, similar to a registrar in the UK) and legalized before Attorney General of the Dominican Republic. In order to allow time for this to be done you should ensure that you travel to the country in good time, prior to a planned Caribbean wedding ceremony; allowing at least a minimum of 3 days notice to resolve these proceedings would be wise. - Indeed if either partner, that is getting married in the Dominican Republic, is in fact Dominican, they must also present their identity card, letter to confirm their unmarried status and/or any decree of Divorce, where appropriate. - In addition foreign visitors to the DR for the purpose of getting married, must also present their original birth certificate. - Two witnesses are required when you are getting married in the Dominican Republic, so they must be sure to be carrying their passport, or identity cards if they are Dominicans -- for presentation as necessary. You can read also our detailed Caribbean wedding tips right HERE. As far as where to you might consider getting married in the Caribbean within the DR, then highly regarded luxury hotel setting with private beach front areas in Punta Cana, Boca Chica, Samana amongst others are popular places to get'tie the knot'. If you want to save a lot of trouble for yourselvers when getting married in the Dominican Republic, then handing over the main aspects pf organization to professional wedding planners employed by one of the many luxury Domincan Republic resort hotels is a popular answer. Most hotels in the Dominican Republic are only too happy to assist anyone planning on getting married in the Caribbean. They can arrange all the paperwork and advise on the legalities, prepare the marraige ceremony and the wedding banquet. For this the hotel will usually benefit from having your weeding party and guests staying and taking accommodation, so it is valuable business to them and their expertise can usually be relied on -- though it never harms to 'Google' for reviews, to see how others getting married in the Caribbean resort have fared. Hotels will usually require a minimum of 45 to do all the preparation for you as part of a deal. See our list of popular Dominican Republic hotels and resorts for Caribbean weddings page, for more details and ideas. 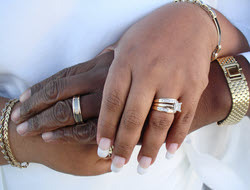 You can, of course, also choose to celebrate your wedding in a church in the Dominican Republic, while the procedures are somewhat tedious, and include amongst other things the need to take a HIV test, there are already some specialist wedding planning agencies that can help make these procedures as 'painless' as possible.